The crisis in Europe is giving us an excellent company at a fair price. This is why it pays to keep a little bit of your portfolio in cash. Things can happen in the stock market that we would never suspect. Case in point: the U.K.'s vote to leave the European Union -- "Brexit" -- shocked the world's markets and has had an asymmetrical effect on certain stocks. Consider what's happened to some of the country's biggest banks, including Barclays, Lloyds, and Royal Bank of Scotland. But I'm not here to tell you to buy into shares of these companies. Instead, I think there's another very well known company whose stock is absolutely on sale: The Priceline Group (NASDAQ:BKNG), parent of Priceline.com, Kayak.com, and Booking.com, among others. In fact, I'm so excited about the 15% sell-off in the company's stock that I'll be buying shares as soon as Motley Fool trading rules allow. 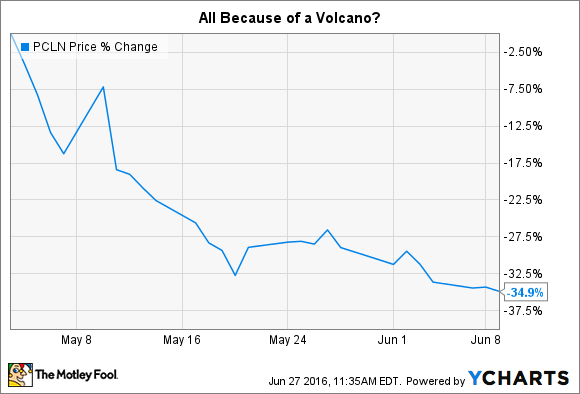 So why is Priceline's stock down so much? To most Americans, Priceline is best known for its "Name Your Price" function made popular by William Shatner's commercials. But over the years, this company has come to depend more and more on international revenue via its Booking.com website. Here's how you should consider Booking.com: It is Airbnb for European hotels. Booking.com had 850,000 properties listed in 220 countries as of February. About 45% of those were vacation rental properties, which will soon compete directly with Airbnb -- but that rivalry is a subject for a different article. The bottom line is that Booking.com benefits from an incredibly strong competitive advantage: the network effect. As more and more people list their properties on Booking.com, more and more users flock to the site, which brings more properties to the site, and so on. It is a virtuous cycle that makes the Booking.com platform very valuable. Here's how the company's international revenue has grown since 2008, with Booking.com contributing the vast majority of said growth. Other countries could exit the European Union, which could lead to ... further devaluation or eventual abandonment of the euro common currency. Significant fluctuations ... impact consumer travel behavior. Consumers traveling from a country whose currency has weakened against other currencies may book lower ADR accommodations, choose to shorten or cancel their international travel plans or choose to travel domestically rather than internationally. In short, if Europeans stop travelling so much -- and the euros they spend translate to less in dollars -- Priceline's business will hurt in the short term. This is highly likely. Why is Priceline worth it, then? In 2010, after years of explosive growth, Priceline's stock cratered. The reason? A volcano in Iceland, Eyjafjallajökull, started spewing so much volcanic ash into the atmosphere that flights were grounded across Europe. 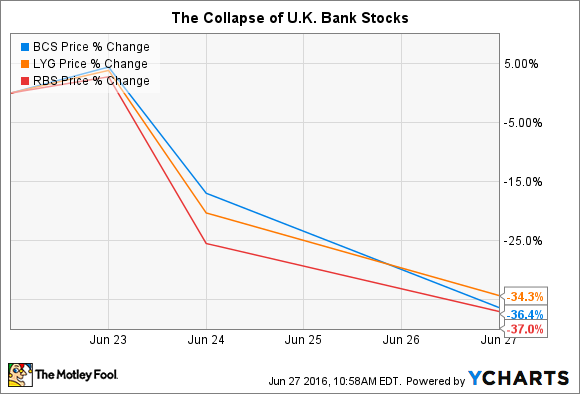 In a five-week span, the stock imploded, losing far more than it has since Brexit. I'll be the first to offer that Brexit has greater long-term implications than a volcano exploding. But the fact of the matter is that conditions in 2010 soon normalized. Within four years, the company's stock was sitting 670% higher! It would be (small f) foolish to expect similar returns this time around. But that doesn't mean you should shy away. The market is offering an opportunity to buy an excellent business at a fair price. Over the next four years, analysts expect Priceline to grow its bottom line by 15% per year. The stock currently trades for 19 times free cash flow and 17 times expected earnings over the next 12 months. While not a screaming deal, that's a very fair price. Over the short term, consumer confidence is the key variable that will determine if travel habits change. If the EU defections stop with the U.K. -- and the public soon adjusts to this reality and the years-long process that will resolve the divorce -- travel habits may not be disrupted at all. Over the long run, even if further defections occur, Priceline still owns what is by far the most powerful accommodation portal in Europe. There may be hiccups along the way, but such a strong competitive advantage won't disappear. Since I plan to buy and hold the stock for at least ten years -- as long as my thesis is valid -- such hiccups don't bother me at all. In the meantime, I might even see how affordable a European trip may be, now that the dollar is so strong!